At the blog Bleeding Heart Libertarians, Jason Brennan recently posted this picture outlining the distinction between political philosophy and political theory. Source: Jason Brennan, found here. On the view Brennan develops, political philosophy isn’t sensitive to empirical facts and it doesn’t pretend to be. Whereas, political theory claims that it engages in analysis of empirical facts but doesn’t actually do so (at least not in any serious way). Political philosophy is clear and well argued. Political theory is neither of these things. In short, on Brennan’s view, “political philosophy” is synonymous with “good” and “political theory” is synonymous with “bad.” While Brennan likely meant this description partly in jest, what strikes me is that some people, perhaps including Brennan himself, do have this view of the distinction between political philosophy and political theory. For example, as a student, I recall that when I asked about the distinction between the two fields of study, people would often say that political theorists do what political philosophers do but that they just weren’t as good at it as political philosophers. I think this is a prevalent view. That the view that Brennan describes is false is established by the fact that there are numerous examples of what is typically thought to be “political philosophy” that exhibit the characteristics that Brennan associates with political theory and vice versa. I won’t name names, but I am certain that many of us can think of examples of work in political philosophy that are unclear, poorly argued, or that claim to engage in facts without actually taking them seriously. As a political philosopher (in the sense that I describe below), I am less familiar with political theory as a field, but I am equally certain that there are examples of works by political theorists that not only claim to appeal to empirical facts but actually do so and are also rigorously argued. I think Catherine Lu’s (a Canadian political theorist) work on colonialism and structural injustice is a good recent example of this type of work and there are likely many others. If all of this is right, then it seems that Brennan got the distinction between political philosophy and political theory wrong. Perhaps this is obvious. So, the less obvious matter is, what exactly is the distinction between political theory and political philosophy? What is also less obvious is, why does this distinction matter? One view of what distinguishes political theory (and which can be phrased in a less negative way than Brennan manages to) is that political theory aims to take empirical facts more squarely into account than political philosophy. I think this is one standard way of understanding the distinction. My own view is that, if we understand the distinction between political theory and political philosophy in this way, it is becoming less and less relevant and may even be giving way. There are many political philosophers who have been and are working hard to take facts into account as part of their theorizing about democracy, justice, and many other topics that are central to political philosophy. There are many political theorists who have been and are working hard at taking a more philosophical and rigorous approach in their work. Finally, given the tough job market in philosophy, many people who would traditionally have self-identified as political philosophers will find themselves with positions in political science departments, being labeled as “political theorists” and working with other political theorists. So, overtime, this will inevitably lead to more overlap in the way that both sorts of thinkers develop their work. Does this mean that there is no distinction between political philosophy and political theory? If there is a distinction between political philosophy and political theory, I wonder if it isn’t a practice dependent distinction. As it is practiced, political philosophers tend to read certain people and work on certain problems in a way that flows from and is framed by the work that they read. Something similar could be said of political theorists. For example, it seems to me that one factor that distinguishes those working in contemporary political philosophy from those working in contemporary political theory is what they take their starting points to be. Many of those working in contemporary political philosophy take Rawls as their starting point. In contrast, many of those working in contemporary political theory take Habermas as their starting point. These starting points become the framework for approaching the problems and issues that members of each group pursue and which, I think, leads to some difference in how these problems and issues are conceptualized and analyzed by members of each group. Another difference might be related to the sorts of journals that each group reads. Political philosophers traditionally do not read Political Studies or Political Theory. And many political theorists traditionally may not read Ethics. This is all to say, I don’t think that there is a deep difference between political philosophy and political theory. As the practices of each approach become similar and intertwined, the distinction is likely to fade. I think this is likely to lead to some of the most interesting and fruitful work in political philosophy. In the end, I also don’t think that the matters of whether there is and what the distinction between political philosophy and political theory might be are of much significance. What matters more is the question of what kind of practice counts as good practice when it comes to theorizing about political matters, whether one works in political philosophy or political theory. 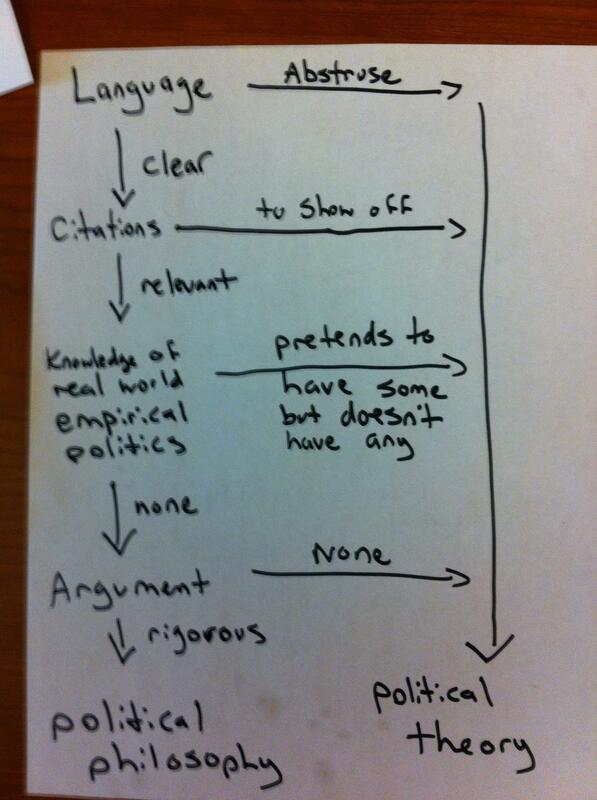 Clarity and rigorous argumentation are essential to good theorizing in any field, but are perhaps of particular importance when it comes to political issues (because of their connection to the real world). Knowledge of facts and at least being sensitive to the connection between facts and theory may also be a necessary component of good theorizing about political matters. Furthermore, at least one of the things that Brennan identifies as a problem with political theory is something that should be understood as required for good theorizing in both political philosophy and political theory, namely, citation. As has been pointed out numerous times elsewhere, philosophers, including political philosophers, are particularly bad at citing other relevant and related work and, as a result, may tend to rehash ideas that have already been discussed and criticized rather than developing new ideas. This practice does not lead to progress within the field. So, significant citation may not be a matter of “showing off”, as Brennan puts it, but rather a demand of rigour and perhaps should be identified as such. These are just a few ideas. There are likely many more qualities that good political philosophy and political theory should aspire to. This is something worth discussing. Thanks, SL. I agree, the analytic-continental divide is likely playing a role in some (if not many) people’s negative judgments of political theory, especially if these people are analytic philosophers. I think this is starting to change, though, as there are many analytic people working on figures that were traditionally taken to be central to continental philosophy such as Nietzsche. I am hoping that just as the divide between continental and analytic philosophy seems to be collapsing that something similar will happen with political philosophy and political theory. I think this can only improve the rigour of the theorizing in both fields. My pleasure! Love your blog.